Chinese people took many roads to get to the goldfields of Victoria in the 1850s. 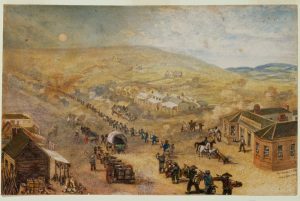 Image: Samuel Charles Brees, Flemington Melbourne, watercolour, ca 1856, courtesy of State Library of Victoria. Chinese culture would influence Victoria in many unexpected ways. 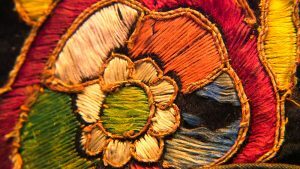 Image: Parade costume jacket (detail), silk, cotton, gold thread. China, c. 1880. Courtesy of the Golden Dragon Museum. Image by Jary Nemo. Chinese miners faced discrimination which they resisted through petitions and other means. Image: Petition to Governor Barkly. PROV, VA 475 Chief Secretary’s Department, VPRS1189/P0, Inward Registered Correspondence, Unit 522, Item: 59/7364, Sub Item: B82/59. Courtesy of Public Record Office Victoria. Image by Jary Nemo. The digital exhibition features video and audio interviews with historians and experts such as Anna Kyi, historian. Image by Jary Nemo. The digital gallery features 100 images of engravings, maps, photographs, documents and artefacts. 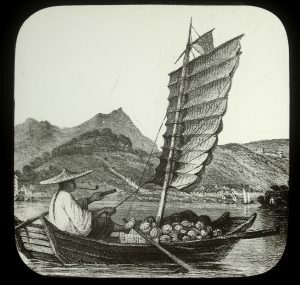 Image: Going to market, China [picture], John Henry Harvey, photographer, Thomas Allom, artist. 1 transparency : glass lantern slide. ca. 1900-1920. Courtesy of the State Library of Victoria. In the 1850s tens of thousands of Chinese people flocked to Victoria, joining people from around the world who came here chasing the lure of gold. Fleeing violence, famine and poverty in their homeland they sought fortune for their families in the place they called ‘New Gold Mountain’. Facing discrimination and injustice they carved out lives in this strange new land. The Chinese took many roads to the goldfields. They left markers, gardens, wells and place names, some which still remain in the landscape today. At the peak migration point of the late 1850s the Chinese made up one in five of the male population in fabled gold mining towns of Victoria such as Ballarat, Bendigo, Castlemaine, Beechworth and Ararat. It was not just miners who took the perilous journey. Doctors, gardeners, artisans and business people voyaged here and contributed to Victoria’s economy, health and cultural life. Many Roads: Stories of the Chinese on the Goldfields of Victoria showcases the extent of the Chinese influence in the making of Victoria, which reaches farther back than many have realised. The all-digital project features an eleven minute film featuring curators, historians and Chinese Victorian descendants, two extended audio interviews and one extended video interview with key experts, a digital gallery featuring a hundred images of artefacts, documents, photographs and illustrations from museums, galleries and historical societies, and six essays written by Victorian historical experts. The story canvasses the discrimination the Chinese faced and the famous overland treks the Chinese were forced to take to get to Victoria, but also the various positive ways the Chinese contributed to the economy and culture of Victoria. 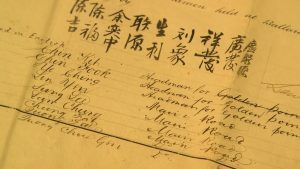 All items in the digital exhibition are free to watch, show and share from the link https://cv.vic.gov.au/stories/immigrants-and-emigrants/many-roads-stories-of-the-chinese-on-the-goldfields-of-victoria/ . The project was commissioned by Culture Victoria, an online platform that shares the stories held by collecting organisations across the state. It was produced by Ballarat-based production company Wind & Sky Productions in collaboration with the Museum of Australian Democracy at Eureka, the Gold Museum- Sovereign Hill Museums Association, the Golden Dragon Museum Bendigo and the Gum San Chinese Heritage Centre Ararat. The story’s 11 minute documentary film explores the story of Chinese people in the Victorian gold rush, uncovering the routes the Chinese took to seek gold, the lives they lived and the sort of people they were. The film contains beautiful montages of archival images, illustrations and photographs from Victoria’s regional collections. It features interviews with Cash Brown, Curator and Conservator at the Museum of Australian Democracy at Eureka, Anita Jack, General Manager of the Golden Dragon Museum and great grand daughter of a goldrush-era Chinese migrant, Professor Keir Reeves, Director, Collaborative Research Centre in Australian History, Federation University Australia, and Heather Ah Pee, Former Coordinator, Gum San Chinese Heritage Centre and related by marriage to a goldrush era Chinese forebear. 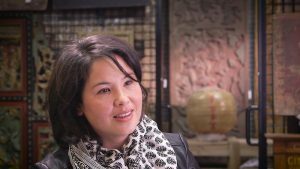 An extended video feature includes a full interview with historian Anna Kyi on attitudes towards Chinese migration from the 19th century to the present, harmony and conflict on the goldfields and the complexity of the Eureka story. This project was created for Culture Victoria with the support of the Victorian Government through Creative Victoria. Project production and development took place on the traditional lands of the Wadawurrung, Djab Wurrung and Dja Dja Wurrung peoples. We would like to acknowledge these traditional owners and pay our respects to their Elders, past and present. Wind & Sky Productions ©2017 unless otherwise acknowledged. We favour projects that engender social responsibility and promote positive change. We take great care over every story, large or small. We are in an era where communities can interact with data in ways that were impossible to imagine a few short decades ago. In 1970s Melbourne a group of students made a stand for gay pride at a time when homosexuality was criminalised and discrimination and abuse was widespread. This live musical celebration of the Irish in Australia featured documentary visuals and special effects by Wind & Sky Productions. Photo by Benjamin Knight.